Mason Tavern, Decatur GA – Marie, Let's Eat! You know how that first week after the time change, it feels like the middle of the night when it’s only seven o’clock? And how the rain doesn’t help? Well, a couple of weeks ago, Daylight Savings Time ended and Marie and I accepted an invitation to visit Mason Tavern, the newest restaurant from the Concentrics Group. It opened earlier this summer, on Clairmont in the same strip mall as Community Q. They’re aiming for an above-average “community gathering place,” and, with Chavez Hernandez, formerly of Saltyard, in charge of the kitchen, they’ve assembled a new Southern menu with many of the usual suspects in this category of late – hot chicken, pork belly, brunch – and a particularly interesting beer menu. All of the beers they have on tap are from Georgia brewers, which is wonderful. At some point between 6 pm and 2 am – it’s difficult to say – I arrived at the restaurant, before Marie, and ordered one of those pork belly dishes. 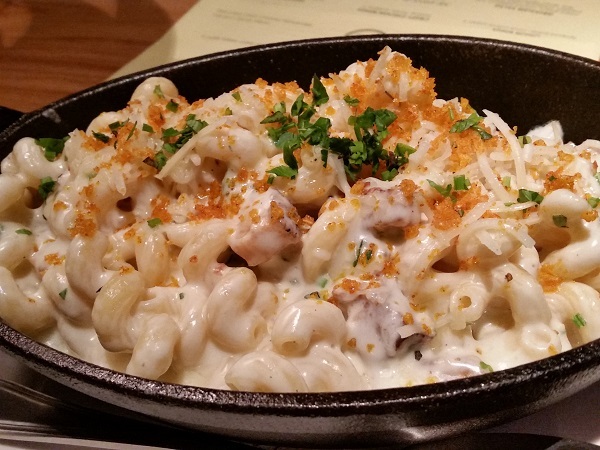 The Piggy Mac & Cheese seems to be one of the standout dishes that people are talking about, and with good reason. It’s delicious, a gooey mess served in a skillet that keeps it warm so that any members of your group who are late to the table will still have a nice, hot, melty appetizer to snack on. There are fifteen different small plates on the menu. Four of them would make a fine meal for a party of three, or order a couple to accompany a larger meal. 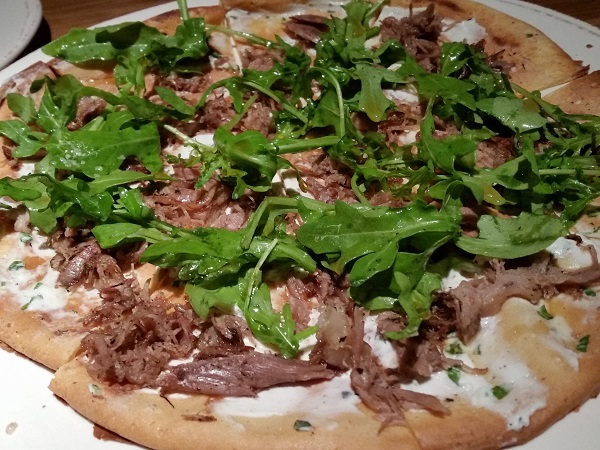 Marie picked the Dutch Baby – a small pizza topped with duck and arugula – and the deviled egg plate, which came with an assortment of other pickled vegetables. The Baby was pretty good, but the egg plate was just fantastic. 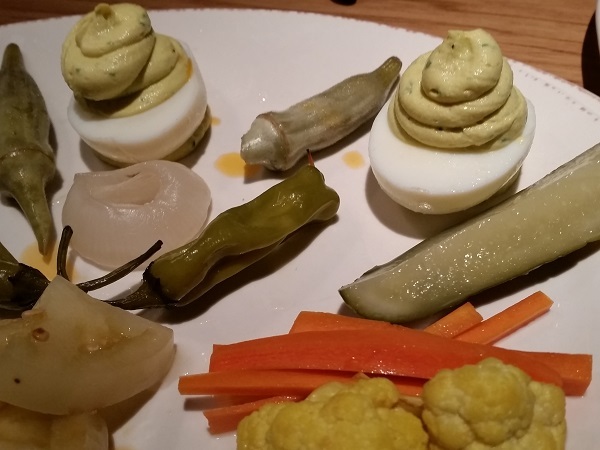 I loved the pickles, the tomatoes, and the okra, and the eggs are as good as anybody else’s in the city. Our feelings on the sandwiches were a little mixed, however. 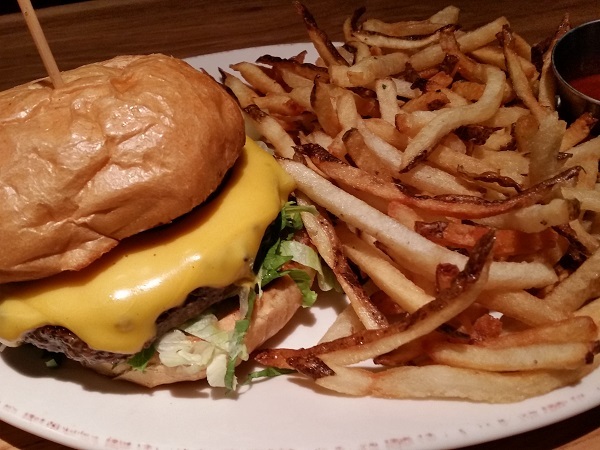 In the plus column, the Tavern Burger is really great. Marie went back and forth between this and the trout, but she decided that after the long drive through awful traffic and rain, she wanted the comfort of a big, greasy burger, and this bad boy, made from a blend of chuck, brisket, and short rib, and given a smear of Russian dressing, really hit the spot. This is a very, very good burger. 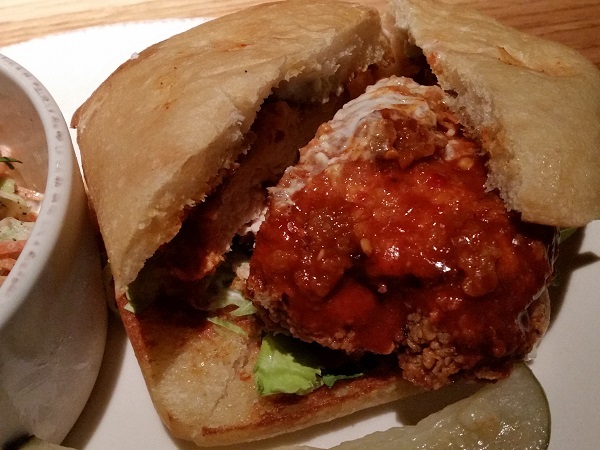 Unfortunately, the Hot Chicken Sandwich was the least of the five things that we tried. We enjoyed everything else very much, but this is more in line with a Buffalo chicken sandwich rather than something inspired by Nashville. It’s drowned with a mild “hot” sauce and given a little blue cheese dressing. While it is not actually a bad sandwich, but I’d rather sample the rest of the menu before circling back for another of these. The service was really excellent, and we liked the design and the vibe. It’s a well-managed restaurant in a busy, crowded location – bear in mind, as with anything else around here, that Clairmont Road traffic has grown exponentially worse over the last few years – with some solid winners on the menu and many other promising selections. We enjoyed our evening very much and would consider stopping by again. Posted on November 25, 2015 July 15, 2016 by Grant G.Posted in atlanta, georgia, modern americanTagged atlanta, decatur, georgia, modern american. Was just there last night! Wish I had read this prior to going – would have probably ordered the burger instead of the sweet pea ravioli, which was just okay. They get points for originality for that dish, though. I don’t think I’ve ever seen sweet pea ravioli on a menu before.